I would recommend this amazing book to anyone who is desperately seeking grace and they are tired of following religion and all the rules. I liked how open Kendra Fletcher was about her trials and her fears she experience in her life. Kendra’s suffered the fear of losing her young child to a deadly virus and eventually the baby went into a coma. She also ran over her five year old with her car and the amazing story about how miracle nothing was broken. Her eight year old had a rupture appendix. Not to mention, that all of this occurring in a two year span. All of this helped her to realize she didn’t have a close relationship with Christ. She placed her identity in the wrong things. She had to learn about the love of Christ and how to accept grace. I especially connected with the importance of receiving grace and finding our true identity completely in Christ. Kendra and her family went through a bunch of difficult situations and they had to learn how to rely on God and receive his grace through it all. Find out more about Kendra at http://www.kendrafletcher.com. In The One, Ryan and Amanda Leak shared how they met and how they fell in love. They decided to get engaged and married on the same day. Amanda revealed to one of her best friends that she would love to get engaged and married on the same day. So Ryan was determined to make her dream come true. It took a lot of planning and making sure Amanda had no idea what Ryan was really up to. This book is written to encourage single people and married people to not settle than less than God’s best and to wait on His timing. They both encouraged single people to work on themselves and make sure they are whole and take time to heal from our past wounds. They also recommended to not living our life waiting for our special someone to enter our lives. We need to be actively living our lives without them and living a life to the fullest. Life doesn’t begin when we meet them. I would recommend this amazing dating and marriage book to anyone who is ready for a deeper marriage. 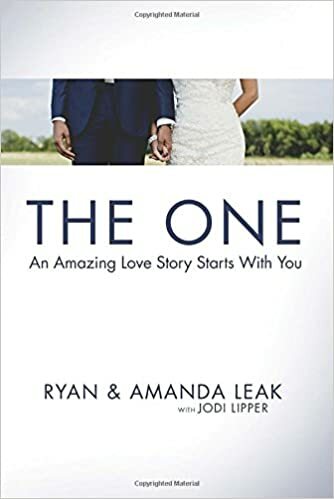 I especially liked how open Ryan and Amanda Leak was and how they took turns conveying the message that was on their hearts to encourage their readers. I’m currently single and this book helped to reinforce the importance of making sure I’m whole and healed from my past before trying to merge with another person. I don’t want the past to contaminate my future wife. I loved their story and how extremely high Ryan set the bar for all guys. Most people won’t necessary get engaged and married within the same day. This book is an excellent read for single and married folks and I believe it will help strengthen and help build your marriage.